Our newest future Bluecollar Champions! Chez finished his championship July 17th, 2015 with a 5-point major! Fancy currently has 5 points with 1 major. Cora’s puppies are in the ring! Bluecollar Boxers is proud to feature puppies from Cora’s two litters in the show ring now. Watch for new achievements for Jake, Chez and Fancy on their journey to AKC Championships and beyond, and follow Duke and Pixie as they start their show careers in September 2015. Well Done Cora — GCH Bluecollar’s Untamed Heart of Texan!! 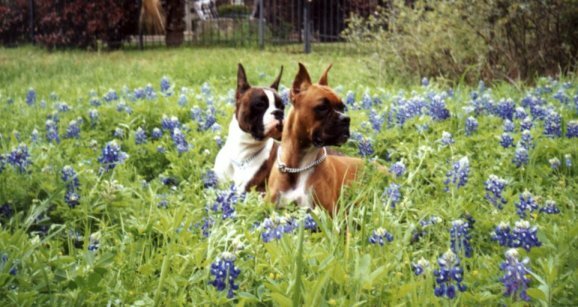 Bluecollar is a small kennel in San Antonio, Texas, where we believe that boxer breeding should stay true to the working origins of the breed. Sound temperament, working drive, conformation, health, and improvement of the boxer breed are the goals that guide our kennel. We are members in good standing with the American Kennel Club (AKC), the American Boxer Club (ABC), and the Bluebonnet Boxer Club of Cypress, Texas. Our boxers are active in conformation shows, agility, obedience, and therapy work.